For this challenge, I went to Mexico! Since learning about Dia de los Muertos a few years ago, I’ve come to love the celebration and all the traditions surrounding it. Last year, after learning about this celebration in Spanish class, Spud created an altar for his sister, Sarah Catherine (if you’re new around here, Sarah Catherine is my 3rd child. She was stillborn at 28 weeks nearly 5 years ago). 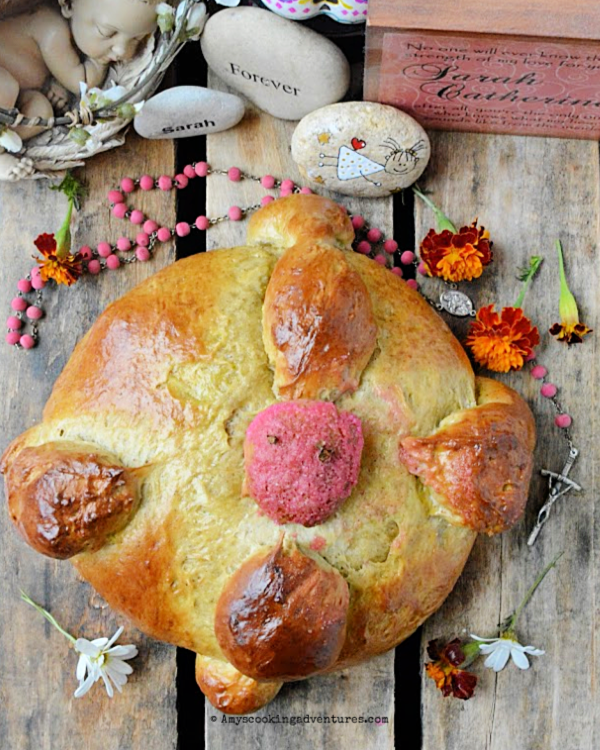 This year, both of my boys made another altar, and I added Pan de Muerto, or Bread of the Dead. The shapes on top of the bread are meant to represent bones. 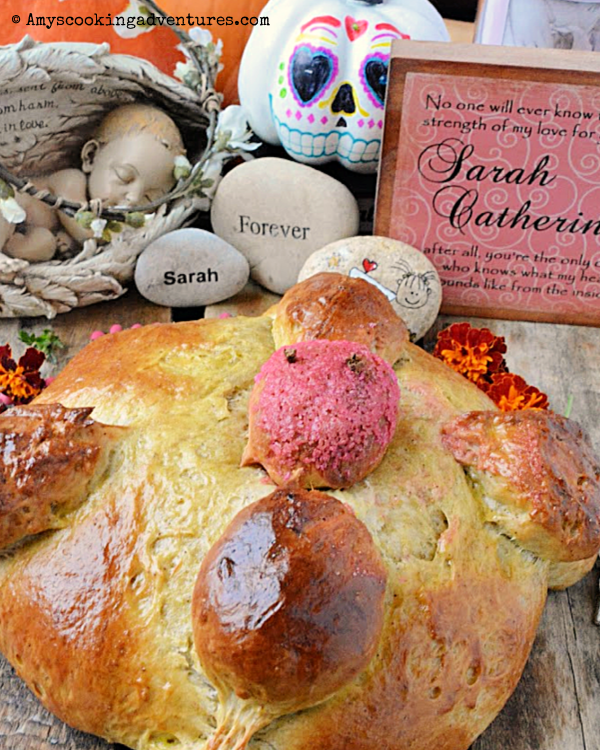 Pan de Muerto is traditionally brought to a gravesite altar to share with the dead. As I researched the bread, I noticed that, while the basic dough recipe and shape are consistent, there is some customizability in the spice profile. In my short search, I found breads containing, orange zest, orange blossom water, anise, and clove. I chose orange and clove for this recipe. The bread was sweet, spicy, and just perfect for this challenge. I’ll look forward to continuing this tradition for years to come! Place the butter, sugar, cloves, salt, and ¼ cup flour into the bowl of a stand mixer fitted with the paddle attachment. Mix on low until the ingredients come together. Add the water, eggs, zest, and another ¼ cup flour and mix until combined, scraping down the bowl, as needed. Add the yeast and another ¼ cup flour and mix until combined. Switch to the dough hook. Slowly add the remaining flour until the dough is no longer sticky (tacky is ok). Continue kneading with the dough hook for 2 more minutes. Place the dough in a greased bowl, covered with a clean kitchen cloth. Place the bowl in a warm area. Allow the dough to rise for 1 hour. Punch down the dough, remove ¼ of the dough to shape into bone shapes. Shape the remaining dough into a ball. Whish an egg with a tablespoon of orange juice. Brush glaze over the dough and add the bone shapes. If desired, roll the center shape in sanding sugar. Loosely cover the dough and allow to rise for an additional hour. Preheat the oven to 350 degrees F. Brush the dough with glaze again, then bake for 30 minutes. Check the bread. Brush with glaze, then cook for an additional 5-10 minutes or until cooked through. To tell is bread is done, use a thermometer to see if the bread is cooked to 190 degrees F or flip the bread and knock on the bottom. If the bread sounds hollow, it is done. Cool before cutting. Check out all the wonderful Halloween around the World recipes prepared by fellow Eat the World members and share with #eattheworld. What a wonderful tribute to Sarah and what a great way to let the boys pay homage to her. That's a beautiful bread and lovely altar, Amy. Thanks for sharing! I love spiced breads, esp ones with egg an butter in them! Thanks for sharing.